I had quite a few overripe bananas waiting to be used so my first instinct was to make a banana bread. But I felt the need to do more than that. With other great ingredients eagerly waiting to be used, I added them in to make a typical banana bread go from blah to bravo! I really liked how this turned out as a gluten free bread and it was especially good toasted. I used leftovers for french toast that Joel really enjoyed. This freezes well too! Combine chocolate-hazelnut spread and 1 teaspoon oil in a microwave-safe dish; microwave at HIGH for 30 seconds or until melted. Stir. Combine 3 tablespoons oil, butter, brown sugar, and banana in a large bowl; beat with a mixer at medium-high speed until well blended. Add eggs, 1 at a time, beating well after each addition. Weigh or lightly spoon flour into dry measuring cups; level with a knife. Combine flour, baking soda, baking powder, and salt. Beating at low speed, add flour mixture and buttermilk alternately to banana mixture, beginning and ending with flour mixture; beat just until combined. Scrape half of batter into a 9 x 5-inch metal loaf pan coated with baking spray, and top with chocolate-hazelnut spread mixture. Spread remaining batter over chocolate mixture. Using a wooden pick, swirl batter. Sprinkle batter with hazelnuts. Bake at 350° for 55 minutes or until a wooden pick comes out with moist crumbs clinging. Cool 10 minutes in pan on a wire rack. Remove bread; cool on wire rack. Place bittersweet chocolate in a microwave-safe dish; microwave at high for 30 seconds. Drizzle bread with chocolate; let stand until set. 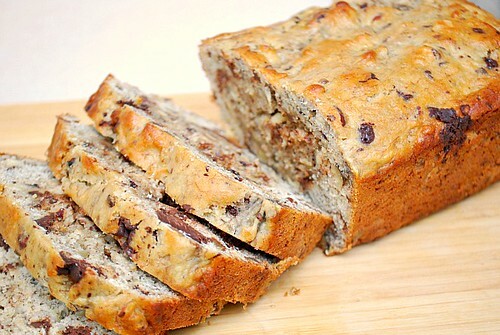 I grew up on chocolate chip banana bread. What a great update.